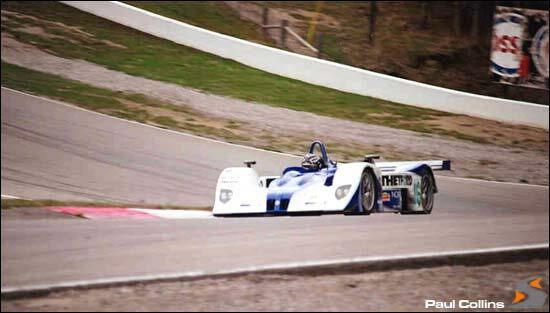 Dyson Racing was at Mosport for testing this Tuesday, Wednesday and Thursday (May 6-8). Both MG-Lola EXG257s were present, pounding around on a full slate of tests. I arrived around 9:30 on Wednesday, to meet Chris Dyson, James Weaver and Andy Wallace: I didn’t see Butch Leitzinger until a little later in the morning. 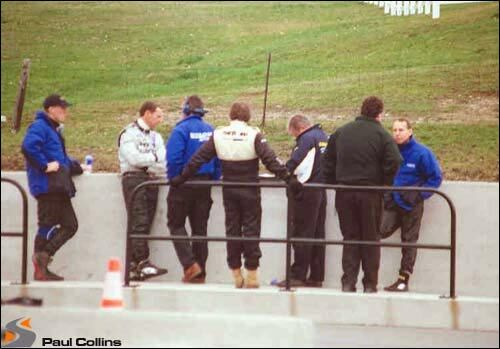 As I arrived, Andy was just hopping out of the car and the mechanics went to work adjusting and downloading data. Naturally, as soon as I arrived, the #16 car had what was termed a “small water line problem,” and was hauled into the garage for a little more extensive work. I was immediately dubbed the bad luck charm by the team. 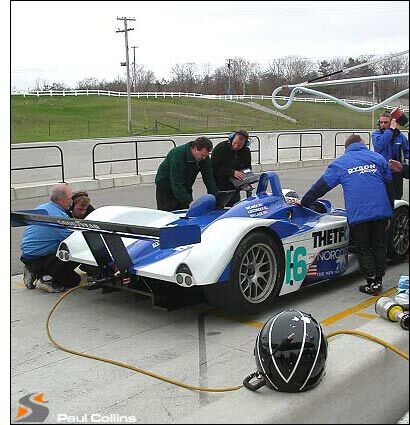 Meanwhile, #20 was being fettled in its garage. “We’re really pleased with the data that we collected yesterday (Tuesday),” Chris Dyson said. “We were able to get a lot of laps in, and really test our Goodyear tires.” Wednesday’s program involved more tire testing, engine testing, and endurance testing for the newly installed / repaired power steering system. While I looked around the garage, the only thing I noticed that was potentially new on #20 was the rear deck lid, which did not have the “Thetford” logo on it at the side, as can be seen in Sebring photos. The driver names were also missing, and the roll hoop was painted yellow. My untrained eye could not spot any changes to the configuration, though. As well, one of the nose pieces was missing its number, which suggests aero tweaks at the front. When I had a chance to speak to Andy, I asked him about his experience with the Dome. He seemed genuinely happy with the Le Mans Test Day, and to be reunited with Jan Lammers. He was also happy with the Dome Judd. The chassis was pretty well-balanced, but he didn’t find that out on his first flying lap – coming through the Porsche curves on his out-lap, the car’s front wheels would bounce a little. “Ah,” he thought, “this car is a little bouncy.” But coming through the first corners ‘on the fly’, the right front lifted, and he realized that he’d had a puncture in the rear. He then had to limp home a full lap. The one thing he did have to say was that he was unhappy about the power reduction due to the new restrictors (what driver isn’t?). On the fan’s favourite subject of the chicanes on les Hunadières, he opined that while he preferred the full straight from a pure driving perspective, the potential for punctures not revealing themselves until you’re at full speed was greatly reduced by their introduction, and suggested that, particularly with cars dragging what I gather is essentially crushed rock from the gravel traps, the chicanes were necessary. On the subject of aerodynamics, he said that the Dome, which hadn’t been developed in the previous years, this year had an aero program to evaluate and develop, and they found reductions in drag and increases in downforce that amounted to a 15% increase in efficiency. In the afternoon, as I headed out to Moss corner, I watched Butch put some slow laps in, and then start hammering out the hot ones. He was getting smoother and smoother as the run went on, and really pushing the tires to their limits. After about a half hour, you could see a little wiggle as he hit the exit of the turn, which to me said he was fully committed. You could hear the tires chirp as he hit little bumps while turning in other corners, and the bark of the turbo on every upshift was like a gunshot. By the time I made it back to the pits, the car had been out running for about an hour, and it became apparent that this was a race simulation. 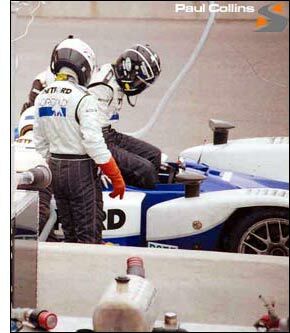 The pit crew were getting nervous, and James was pacing, with his helmet and gloves on. When Butch finally came in, it was a flurry of activity, as the team went through a full pitstop. Butch’s Nomex suit was fully saturated down his back, which showed how hard he was working, given the air temperatures weren’t much higher than about 15C. James then proceeded to put down some hot laps, only to have to cut the session short. I talked to AER's Steve Dumelow about the engine developments, and he seemed pretty happy with the data he was seeing during the test. Boost numbers were comfortably below his threshold, and the behaviour of the engine seemed to please the drivers. Steve felt that the restrictors had robbed them of 50 horsepower, but I got the sense that that situation was temporary. 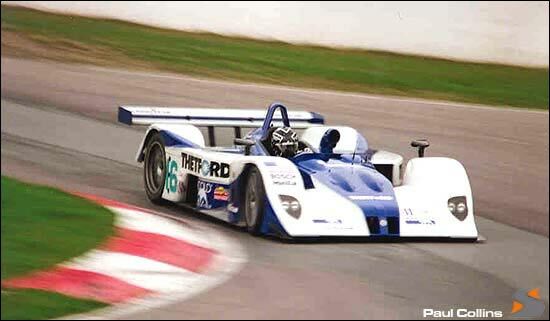 I asked him about how ‘his’ AER firm had ended up supplying the Nissan engine to Multimatic for their LMP675 win at Le Mans in 2000, and he said it was through Lola, as AER has worked with Lola for some time. He also expressed sadness that so many of their SR2 engines were out there, ready to race, but with nowhere to go. 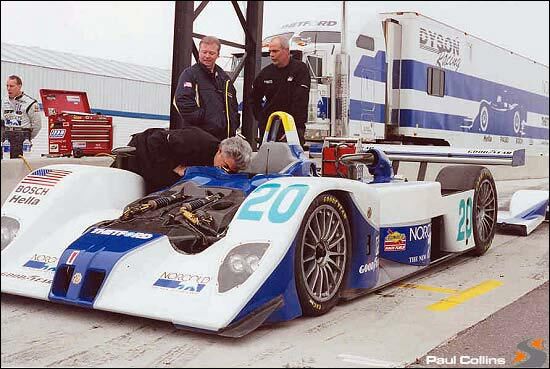 At this point in the afternoon, the #20 car was wheeled out, and Chris Dyson got ready to turn some laps. 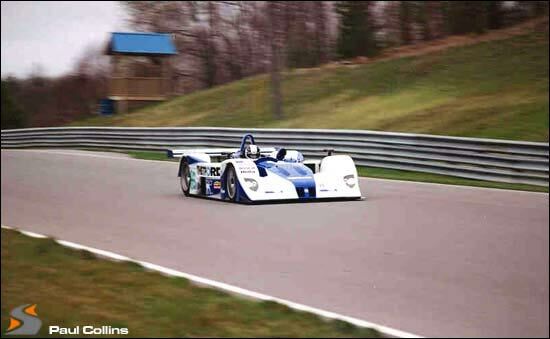 He had earlier discussed this track and its plethora of blind curves, and compared it to Ste Jovite (the other original home of top-level racing in Canada). I was surprised to learn that this track had more, and more drastic, changes in elevation than the circuit built in the mountains. He found this circuit plenty challenging, but with such experience to learn from in his teammates, he was making a real go of it. It would seem that these tests were showing that their developments were helping to overcome the loss of power due to the new restrictor. Last year, the top race lap was 1:08.4; qualifying was 1:07.2 (both by Audi R8s). 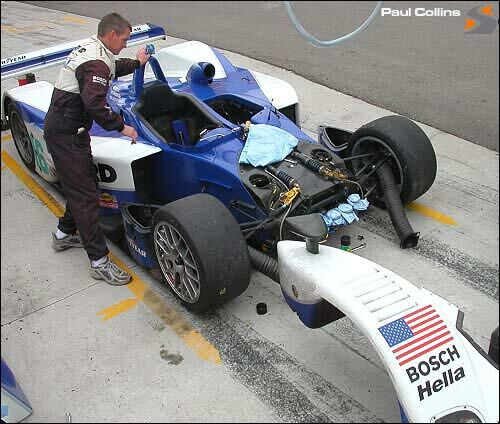 2003 Sebring qualifying suggests that Audi has lost some overall speed (dropping from 1:48.0 to 1:48.8). Can Audi afford any such loss this summer?